Let’s set the scene. You’re sitting on the couch catching up on your favorite TV show and all of a sudden you feel something brush against your arm. First you think it’s a pillow or your computer cord, but when you look down you see a large spider taking his time walking across your arm. You literally freak out! You jump up and flick the spider across the room. For the next few hours you can’t get the thought out of your mind that spiders are crawling all over you. If this happens to you more than you may want to admit, it’s time to call a Minneapolis Spider Removal company like Eco Tech. As one of the leading Minneapolis, MN exterminators we offer full spider elimination using the latest all-natural pest control products to keep both you and your family safe at all times. When you see spiders all throughout your home it likely means that you have a bigger insect problem than you may have imagined. Spiders feed on insects and if they’re throughout your house it likely means that you have other pests making their home in your house. By working with a spider elimination company like Eco Tech we can help to identify which spiders are present in your home and also take care of any other pest control issues that may be attracting the spiders into your home in the first place. 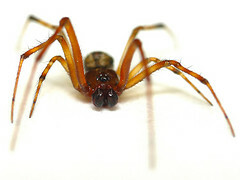 While most spiders are harmless, there are a few species that are poisonous, which is why it’s always best to have Minnesota, MN exterminators come out to ensure that you are not dealing with poisonous spiders. Many spiders look very similar and it often takes a professional to correctly identify them. Some exterminators will come into your home and spray all kinds of harsh and dangerous chemicals anywhere and everywhere. While this likely will take care of your pest problem, it could cause other issues for you, your kids and especially your pets. At Eco Tech we take the health and wellbeing of our customers very seriously. For this reason we only use an organic pest control line of products that are less toxic than some of the products used by other big name exterminators. While we may use less toxic products, this does not mean they are any less effective or that we don’t stand behind their effectiveness. If you’ve finally had enough with your spider problem, feel free to give us a call today at 763-785-1414 and we’ll be happy to come by to give you a free consultation on what it would take for a full spider elimination program in your Minneapolis, MN home.